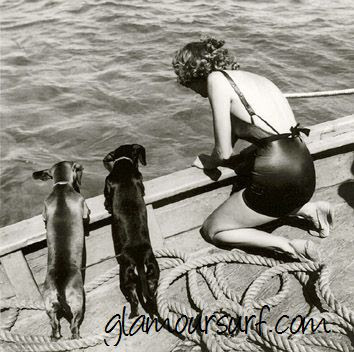 One of Vogue’s first female photographers, Toni Frissell (1907-1988) is considered among the most pioneering artists. Frissell began her career at Vogue as a caption writer, when then editor Carmel Snow, pointed her towards photography. Her work appeared regularly in Vogue from 1931 to 1942 and in Harpers Bazaar from 1941 to 1950. Where earlier photographers relied upon controlled studio settings and static poses, Frissell placed her subjects in nature and in motion. She is also known for the imaginative angles, both physical and metaphorical, from which she covered her subjects. Toni Frissell captured a woman and child standing on a pier in this photograph, which appeared in the June 15, 1941, Vogue. 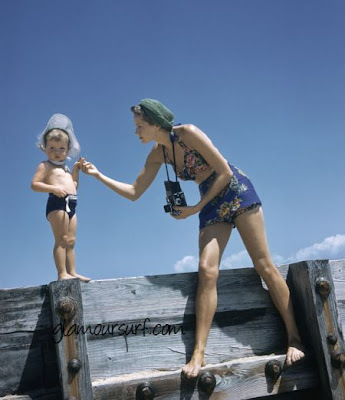 The woman balances a camera and holds the child's hand, as if preparing him to take a picture—but he's more distracted by the other camera, namely Frissell's. The sand and water nowhere in sight, this work is a clever take on a beach scene as well as a cheeky look into a family ritual. Two models chat on a diving board. One wears a flared, belted tunic with chevron stripes; the other sports a blue denim bathing suit with white jersey shorts. Photographer Toni Frissell captured them at an unusual angle, which gives this work a cinematic quality. The image appeared in the July 1, 1936, Vogue. 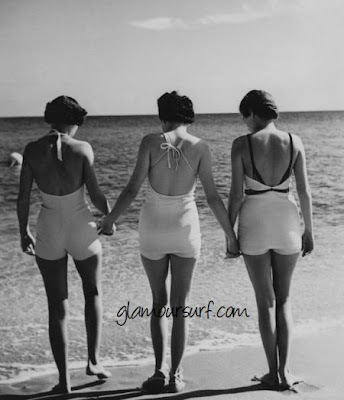 Three models hold hands on a beach in this Toni Frissell photograph, which appeared in the May 15, 1935, Vogue. From left: a white one-piece bathing suit with an open back and halter neck; a white braided silk one-piece bathing suit with an open back and halter neck by B.V.D. ; and a white ribbed knit one-piece bathing suit with dark straps and belt by B.V.D. Despite the period styles, this work has a sense of timelessness, as it resembles more a portrait of friendship than a fashion moment. 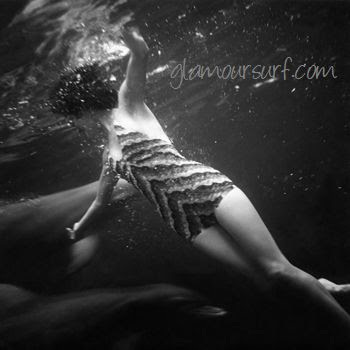 In this Toni Frissell photograph, a model swims with dolphins underwater in a water tank. She wears a striped, crinkled one-piece swimsuit by Brest. The playful image appeared in the January 1, 1939, Vogue.